Childhood memories play a major role in infusing us with a sense of well being. Adult life can never compare with the simplicity and innocence inherent in those years. My brothers are much older than me, which was the sole cause of me being the distraction they had at their disposal whenever boredom set in. Casually walk into my room, observe nonchalantly while I focussedly sharpen my prized possessions, my pencils, line them in my box, size-wise, arrange and re-arrange, then they’d make their move. One by one my pencil points were cold bloodedly snicked off. While I let out a loud wail, they would walk off smirking, gleefully, congratulating themselves, ‘mission accomplished’ writ clearly on their otherwise deceptively guileless demeanour. “Rakhi” though was keenly awaited. Under the sharp supervision of my parents there was no way they could escape giving me that which had been promised. Needless to add, left to their whim, I’d probably have to chase them the year round for my gift. It would be a rare occasion though for me to actually spend the money given to me on Rakhi .Either it was blackmailed off me in lieu of silence over some harmless play which was blown out of proportion to legitimise their criminal intent. Or, manipulated emotionally through sentimental stories of ‘being-broke-and-girlfriends-birthday’ sobbings. Its been quite a while since I have personally tied ‘rakhi’ to them. Physical distance being the culprit here. However the significance of the day can never diminish. India has a repertoire of these quaint traditions, which were purposedly meant to add color, zing and festivity to life as also enhance the underlying cause ,that of perpetuating love between siblings. For the uninitiated a piece quoted on the tradition..
“Rakshabandhan is a very special Indian festival, the celebration of the special bond between a brother and a sister. Sisters tie a special band on their brothers’ wrist on the day of Rakhi as a mark of affection. This thread, which pulsates with sisterly love and sublime sentiments, is rightly called the ‘Rakhi’. It is a way of telling your brother that you’ll never forget how he teased you about everything, yet fought with those who spoke a single word against you and how you bid him farewell with a smile, and only he saw those tear drops in your eyes. 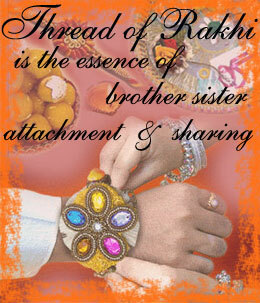 Reach out to your brother on the day of Rakhi with a very special loving message and a beautiful Rakhi. Around mid-August, on Shravan Purnima, Hindus all over celebrate Raksha Bandhan. “Raksha” means protection, “bandhan” means bound or binding. The festival is also known as Balev. As per the traditions, the sister on this day prepares the pooja thali with diya, roli, chawal and rakhis. She worships the deities, ties Rakhi to the brother(s) and wishes for their well being. The brother in turn acknowledges the love with a promise to be by the sisters’ side through the thick and thin and gives her a token gift. Raksha Bandhan tightens the bong of love between the sister and brother. The rich Indian Mythology provides a religious reason to celebrate the day in a specific way. Many epics are related to the day and the origin of Raksha Bandhan. The festival finds a mention in most of the epics and its origin can be traced back to the mythological Pouranik times. The practice of tying thread was prevalent among the Rajputs and our history is full of instances related to the significance of this tradition. At the time of war when the brave Rajput soldiers prepared to go to the battle field, the women folk followed the ritual of tying a thread around their wrist after applying a dash of vermilion powder on their forehead. This was considered a sign of good omen and the ladies believed that it would protect their men from the enemy’s blow and bring them victory. Today Rakhi is tied on the wrists of soldiers by children and women all around the country filling the soilders with the zest to protect them against the dangers of the enemy. Rakshabandhan if taken in true sense has a much broader perspective, the festival encompasses true sense of peace and brotherhood. The values propagated by the occasion if inculcated by all human beings can bring the much-needed relief from the ongoing violence and mistrust. I am a single child:(..this is one day i miss having a brother..cousins are as good though.. i have a couple in australia and one in delhi…so i make it a point to send my ‘threads’ in time. I dont know about the protection bit though. Today its more of a festival that bonds..thats it.. I quite enjoy the tikka and mithai and fun involved..dressing up and al of that…bu that too if we are together..not this time atleast. We are three of us…ALL sisters.. so what we do is tie rakhi to each other. Its okay..no big deal.Ofcourse we miss a brother but as friends we three are real thick.He would have been hopelessly out numbered! anything that promotes love and affection has to be nice! the protection bit as you termed it was a need of the times when the tradition actually gained roots. Women were a hapless lot those days. Anchorage was manifested only through the strong presence of father, husband, brother. This tradition in fact opened doors for women to decide on a brother even if he was not her sibling. Remember the story of Rani of Jhansi? She used it to her advantage in a way. Sending a rakhi to someone was considered a symbol of pristine affection and love…apart from protection. Today ofcourse the scenario has changed drastically. Sisters are known to rescue their brothers from all kinds of unhappy situations. Women empowerment has truly re-defined roles. Its time society acknowledged the New woman and her versatile contribution to society as it stands today. Monica, this is a great idea..tying rakhi among you sisters. Its smbolises a bond above all else..so why not? True.. it is a gesture that upholds values Indiaa has reason to be proud of. Sometimes the gnawing apprehension though.. is it on its way out?? I hope not. And especially if it is reduced to just a ceremony intrinsically devoid of meaning. Great to see your blog and it has very impressive information. I visited this informative rakhi site, it has also very interesting information.